Ask anyone who knows me well, they will tell you that, while I don't wear a lot of jewelry, I love me some cufflinks. Being a girl, I don't find many off the rack items that are cufflink compatible but I've been known to tailor men's shirts and 'hack' the cuffs on regular button downs to give them cufflinks. 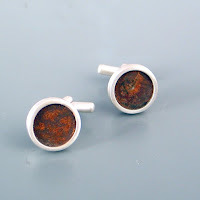 For most people, they own a pair or two and they only drag them out when they're in a wedding party somewhere and it seems like such a pity because, while necklaces, rings and bracelets are "out there" pieces of fashion - big things that people notice - cufflinks are subtle but they can also say so much. I may not have a few hundred dollars to drop on jewelry at the moment, a girl can always dream, can't she? It can be about where you've been or where you are going like these map point cufflinks from luv4sams shop. You can tell someone special that they've left their fingerprints on your heart with these custom, fingerprint cufflinks from lukely. They're billed as a gift for Dad's - and I think that's adorable too - but they'd be a sweet gesture from a bride to a groom as well. (Or vice versa if the bride is as odd a duck as me ;)) There are even cufflinks for the logophiles out there (there are more than just me, right?) if you have a favorite word or phrase that you wear like a badge of honor or a quote that carry's you through difficult days, these custom word or phrase cufflinks are a subtle way to do it. Or, if you feel like you're taking a gamble on love, or just want to remind yourself to take chances every day, there's nothing like a a tiny roulette wheel (Both of these are also from luv4sams.} To round things out, I have to say this awful thing - I'm not a huge fan of train/subway token charms, cufflinks, etc... I feel like it's so "done" that it's lost a lot of its appeal, but since I'm a sucker for the sentimental and I've suddenly come to terms with the fact that I will be leaving my beloved Chicago soon, these Chicago Transit Authority cufflinks from NOOBOO will probably make their way into my collection at some point in the future. 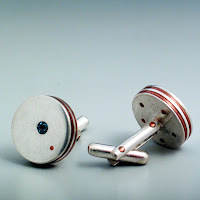 For those among us whose inner child, or at least their inner hobbyist, is a little over-developed, there are tons of conversation starting cufflinks on etsy. CosmicFirefly has a diving bell that appeals to the 20,000 leagues fan in me as well as the part of me that wanted to be a marine archaeologist when I grew up, and their Ouiji Board cufflinks are super cute for the indecisive among us. If Ouiji boards aren't your thing, maybe you're into monopoly or d&d. (From nakedtile and qacreate respectively.) I'm also a huge fan of the Marmite jar's from mixedupdolly. Even if games and obscure European foods don't make your day, everyone has to find something to love among Superman (finkstudio), Teenage Mutant Ninja Turtles (The Clay Collection) or Star Trek (also from finkstudio). If you're the kind of person who can't be quantified, Etsy sellers have your back too. daniellejewelry's abacus's come in several different designs and I'm in love with the military vibe of CosmicFirefly's wings. luv4sam also offers these modern 'bright idea' cufflinks and a fully functional set of compasses. Finally, if you're looking for something bold - so cute for groomsmen, pinktophat's Boys Will Be Boys links can't be beat. From NobleStudiosLTD. 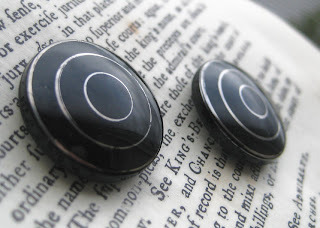 These antique glass button cufflinks manage to look gloriously modern. 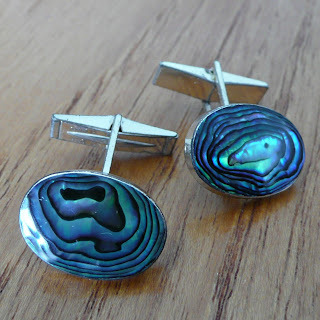 Check out these antique cufflinks from New Zealand brought to you by hansfromsweden's etsy shop. Wood is wood, so don't ask me why I'm constantly falling in love with wood stud buttons, rings and cufflinks but I am. 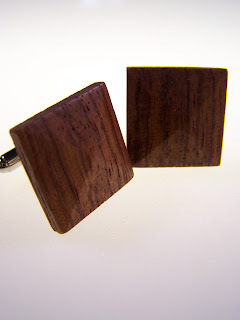 There is something organic about Holcomb's Woodworking and their Bubinga Wood Cufflinks. 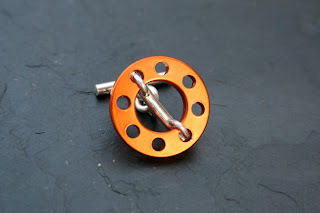 LouyMagroos has tons of fabulous, modern cufflinks - the above are just a few designs. 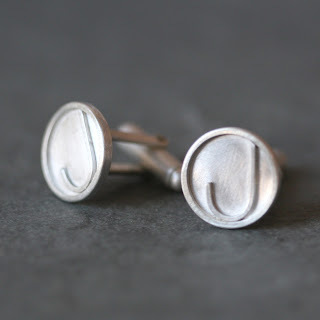 Michelle Chang's custom initial cufflinks are (i think) a much more stylish take on the typewriter key phenomena*. And just when I thought I'd run out of energy to drool over things, I ran across Christine Bossler's etsy shop and fell in love with her alchemical use of metals and stones and ability to find the beauty in rust. *they're cute - but it's so done to death.